Welcome! Nationally known singer/ songwriter Dave Stamey will be performing at Vaquero Heritage Days 2018 "Concert Under the Stars". We've been honored to have Dave at each grand opening of Vaquero Heritage Days. He is a crowd favorite for sure. His many years spent working as a cowboy, a mule packer, a dude wrangler allow him to recall true adventures and day-to-day experiences which he shares with audiences in lyrics and story telling - certainly one of the most popular western entertainers working today! Numerous times voted "Entertainer of the Year" along with "Male Performer of the Year" and "Songwriter of the Year" by the Western Music Association. He has received the "Will Rogers Award" from the Academy of Western Artists. 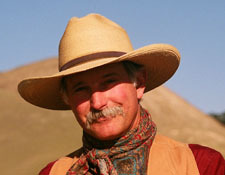 Cowboys & Indians magazine refers to Dave Stamey as "The Charley Russell of Western Music". Dave was inducted into the Western Music Association's Hall of Fame in 2016. Dedicated solely to songwriting, singing & entertaining, his buckaroo days behind him, he delights audiences throughout the country and finds he prefers this to being "stomped by angry horses". Dave and his wife have their home in Orange Cove, CA. Dave's music on CDs will be available Friday at Vaquero Heritage Days.